The psychological and counseling fields have a dizzying array of phrases and terms which are commonly employed by its practitioners. While I often try to keep a distance from a lot of preposterous psychobabble, I will attempt to make note of any with substantiality or validity (hey, I’m no professional, but I can often tell when something stinks and when something doesn’t). 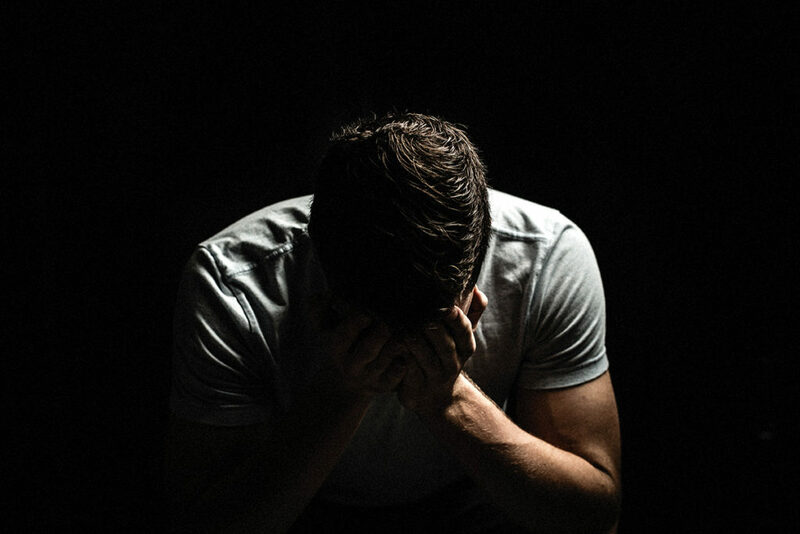 One such concept that’s bandied about, especially in recovery circles, are four major conditions into which people can fall, putting them into a state of weakness, thereby making them more susceptible to fall back into addiction. These make up the acronym H.A.L.T.. They are Hunger, Anger, Loneliness and Tiredness. A lack of proper nutrition and carbohydrates can completely throw your body off. Severe hunger can impair our concentration, cognitive functions and overall judgment. Depression can also stem from extreme hunger. Plus, a lack of eating can also make you quite “hungry” for other things that may not specifically be food; they can be most any replacement that’s physical, emotional and spiritual, and can soften your ability to resist temptation. Jesus Himself was weakened by hunger during His 40-day fast in the wilderness (Matthew 4:1-11, Luke 4:1-13). Satan knew of Jesus’ impaired physical faculties, and went after Him full-force to try to tempt Him. Jesus triumphed over all of the devil’s advances, and never gave into sin. So make sure you eat regularly, and stick to a healthy, balanced diet. Don’t skip meals. Keep nutritious snacks at the ready in case hunger creeps up on you. It’s all part of life to sometimes get angry, but do not let it “give the devil a foothold” (Ephesians 4:27 [NIV]) by letting it flare up and dominate your actions. 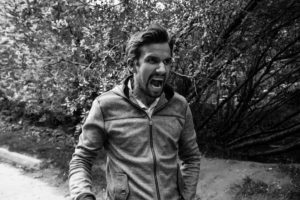 Being mad and irritable can greatly affect your decision making. Whenever you feel this way, stop whatever it is you’re doing, take a deep breath, pray to the Lord, and clam down. If you’re able to, remove yourself from the situation that is angering you. Take an extended break. Get some peace and quiet. Dig into Scripture. Once you’re able to breathe easier, perhaps go back into the situation and tackle the problem in a more loving and constructive manner. We all have been in this condition, as people are made to have a connection to both God and human beings. Feeling isolated and detached from others can potentially be a highly dangerous state in which to be. It can be a doorway that leads to a lot of messy or ruinous stuff. For instance, if we are lonely and are desiring a romantic relationship, we could bolt into a fling with a non-believer or jump into bed with someone, just to crush those feelings of not having a deep, personal connection. Or we could crave to be part of a community, so we go desperately looking for others to hang around with, but often they can be part of the wrong crowd. Being lonely can also lead you to find solace in a vast number of addictive substances that can be detrimental to your spirit well-being. Whenever you feel this way, stop and realize that you’re not alone, for God is always with you. James 4:8 [NIV] implores, “Come near to God and he will come near to you…” The presence of the Holy Spirit is more than enough to give you comfort and peace. The Spirit was given the nickname “Helper” or “Comforter” by Jesus in John 14:26, depending on what Bible translation you are using. And you should also prayerfully look for other believers or church groups to fellowship with and to pray with, for these positive influences can become a solid support system that we might need. 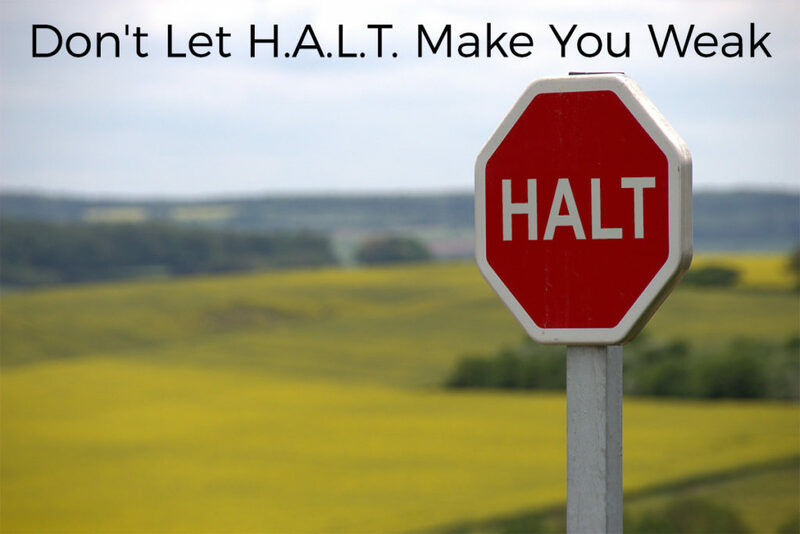 Like the three other H.A.L.T. states, tiredness and fatigue can rob us of sound judgement and concentration. Not getting enough rest can weaken your immune system, wearing you down even further. And it deposits us in a position where we are compromised in our ability to discern sin from doing good. There is a great deal we can blame on modern culture for our stressful, 100-miles-per-hour, always-on-the-go lives. But there is a lot we can do to eliminate some of the schedule-busting activities, errands and responsibilities. Resist the temptation to volunteer for things that have nothing to do with the advancement of the Kingdom of God. Don’t overwork yourself at your job. And remember to always get enough sleep at night! I personally have fallen prey to the “over-volunteering” spirit in the past. I would offer to help out people in various capacities, jump in and assist with projects, try my hand at numerous writing, blogging, podcast, and video efforts, and take on extra website design and voice-over jobs…the problem was, in reality I had very little time for them. I had failed to set aside enough time for sufficient, healthy sleep and periods throughout my day to “recharge my batteries.” In the meantime, the lack of rest and the constant stress made me highly irritable, impatient and short with people, and it greatly diminished my ability to show love and graciousness in a Christ-like way. My advice is to cut down on the amount of tasks and activities. Learn how to say “no.” Get rid of the noise in your life, both figuratively and literally. Turn off the TV completely in your house. Instead, get adequate sleep and the occasional nap, and carve out a sizable chunk of daily time and go to a quiet place and talk with God. Silence your soul and listen for the Holy Spirit. That last piece of advice will refresh and rejuvenate your soul. After only a few weeks of this, you will notice an impressive difference. You will feel invigorated, alert, more discerning to sin, and most importantly, closer to God. Lean on our Lord and never forget, “He gives power to the faint, and to him who has no might He increases strength.” – Isaiah 40:29 [NIV]. Follow brothers and sisters, be mindful of when you get into these H.A.L.T. states, or for that matter, any condition in which your mental or physiological capacities can be compromised. The apostle Paul informed us in Ephesians 6:18 [ESV] to be “Praying at all times in the Spirit, with all prayer and supplication. To that end keep alert with all perseverance…” Jesus Himself commanded, “Watch and pray so that you will not fall into temptation. The spirit is willing, but the flesh is weak.” – Mark 14:38 [NIV].